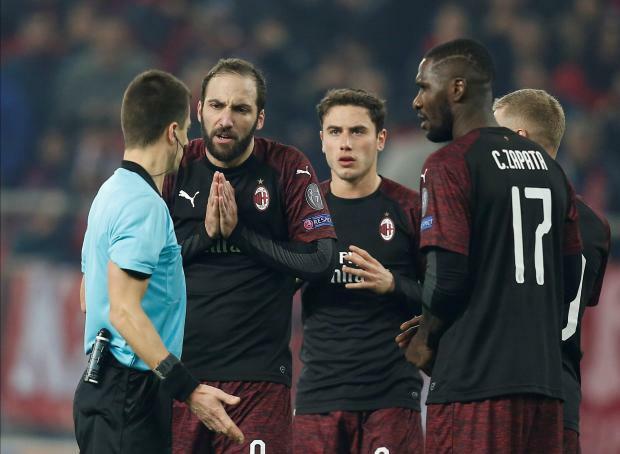 Milan's Gonzalo Higuain and team mates appeal to referee Benoit Bastien after he awarded a penalty to Olympiacos. Olympiakos pulled off a stunning 3-1 Europa League win over Milan that put them into the last 32 and sent the Italians crashing out as the remaining places in the knockout stage were decided on Thursday. Yet Milan’s defensive frailty was punished when Konstantinos Fortounis scored from the penalty spot in the 81st minute to give his side the win that left them second in Group F on 10 points. Chelsea dropped points for the first time this season in the competition as they drew 2-2 with Vidi FC in Budapest, but the game was overshadowed by allegations of anti-Semitic chanting by the visiting fans. Besiktas’s Ricardo Quaresma was given a straight red card for a reckless tackle on Franz Brorsson in the second half. Group C winners Zenit St Petersburg were comfortably beaten 2-0 away by Slavia Prague, who claimed the runners-up spot, rendering Bordeaux’s 1-0 win away to FC Copenhagen meaningless as both sides went out. Despite a 3-0 thumping by Sevilla, Krasnodar made it out of Group J as Standard Liege could only manage a scoreless draw away to Akhisar. They will be joined in next Monday’s draw for the knockout stage by Villarreal, Rapid Vienna, Dynamo Kiev and Stade Rennais.